This is a regional wedding tradition I can get behind- a cookie table! This tradition is regional to southern Pennsylvania/Pittsburgh and some other industrial East Coast cities that have large Catholic populations of Italian or Eastern European groups, says Wikipedia. I can’t remember where I first read about it, but it always struck me as a particularly nice tradition. 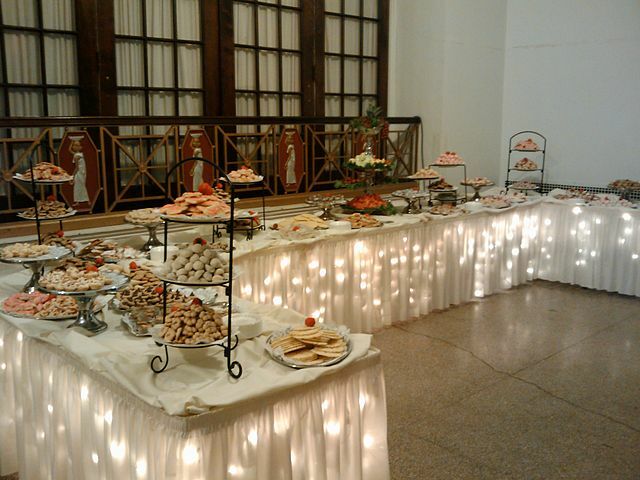 In addition to your usual wedding cake, there is a table full of cookies at the wedding for the guests to enjoy. The great thing is that the relatives of the couple bake the cookies, giving it a great community feeling and something that hasn’t been totally Pinterestified like it’s cousin (and another favorite of mine- the candy buffet). Supposedly the tradition started before wedding cakes were a big thing and it was a way to spread out the cost of the reception between many family members. These cookie tables aren’t playing around, either. I read about one wedding that had 500 dozen cookies! That’s 6000 cookies, and unless these weddings have a thousand guests, that’s an awful lot of cookies per person. This wedding had 200 guests- which is 30 cookies per guest. That’s so many! Even a sweet fiend like me would have a hard time with that. Luckily, you get to take them home to enjoy at your leisure. There is a bit of etiquette involved- are you really allowed to take them home (apparently these days it’s all good and some families even provide containers)? When can you start eating them, from the beginning of the reception or do you have to wait until dessert time (definitely not until after they’ve been revealed, but it depends on what the couple wants)? So, let’s definitely bring this tradition to other weddings because unlike cash bars, who doesn’t love a good, homemade cookie?